It's disappointing. Tragic, even. All those struggles and all that time invested in trying to make the world a better place and this is what they have to show for it. This is what it's all come to. There is a sweeping sorrow to Hugh Jackman's swan song as The Wolverine, but much like its brutal, bloody, and exceptionally R-rated violence, this tone feels justified and necessary. Necessary not only in the aesthetic sense of what is befitting to Logan's world, but necessary in that tragedy always was the way of the world for Logan AKA James Howlett, so why might his conclusion be spared such tribulations? Fortunately for us, but unfortunately for our titular mutant LOGAN is another tale in which our protagonist is pulled into a conflict in which he bears no responsibility in creating, but that his storied past has somehow served as an influence and thus he is then unwillingly pulled into the scenario. This time things are different though, as before and in the many movies we've seen Jackman portray Wolverine the character has always been reluctant, but ultimately unable to deny his true and selfless heroism. He couldn't help but to care, couldn't help but to stand up for the little guy and what he felt to be right, but in LOGAN Wolverine is a much more broken man than we've ever seen him before. His extended past is beginning to catch up with him and we can see that he's tired of playing this role, he's tired of being the hero, of feeling the responsibility to save the day and that he's essentially forcing himself to not care any longer, but rather focus on the task at hand-a task that sees putting himself and an old friend first. In the midst of all this is the centerpiece that is Jackman's final turn as the adamantium clawed mutant making this grief and misery and pain all the more palpable. Jackman so embodies the character at this point though, it's hard to imagine he has a hard time slipping into even the worn and weathered skin of his alter ego at this stage in the game. And while it is Jackman's (presumably) final turn in his most iconic role that is rightly at the center of what makes LOGAN so emotionally rich and narratively compelling there is plenty going on around him that builds the film up in these ways and make it a genuinely thrilling end of an era. Logan (Hugh Jackman) and Caliban (Stephen Merchant) aid Professor X in his ailing state. © 2017 Marvel. TM and © 2017 Twentieth Century Fox Film Corporation. All rights reserved. Set in 2029 LOGAN picks up after the so many years it's been since we left Wolverine at the end of Days of Future Past when he returned to a present day that saw the likes of Jean Grey and Cyclops still alive and Professor Charles Xavier's School for Gifted Youngsters up and running. What has happened since is a mystery as Logan is now driving a limo for cash while making backdoor dealings with hospital staff in order to get Xavier (Patrick Stewart) the medicine he needs to remain stable. Keeping the professor just across the Mexican border the whereabouts of his long and trusted advisor are clearly a secret for some reason, but what that reason is we aren't yet sure. Logan has hired Caliban (Stephen Merchant) an albino with abilities that allow him to detect the whereabouts of other mutants to help him tend to the ailing Professor X. Director James Mangold establishes very early that this isn't a world where Logan or any of his affiliates are working to improve the state of affairs around them, but more that they are simply trying to survive from day to day. Logan is getting older, his healing powers aren't as efficient, and sometimes his claws don't even come out all the way. Xavier is still wheelchair bound, but more times than not he can be found strapped to a hospital bed that stays propped up, hidden inside a collapsed water tower; the professor now having some type of degenerative brain disorder that has turned his mind into what has been labeled, "a weapon of mass destruction". It is as Logan is working to buy him and the professor a boat so that they might sail away from all they once knew once and for all that our titular hero is unwittingly pulled back into the fray. 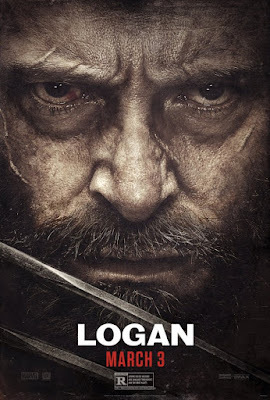 Approached by an apparent mother, Gabriela (Elizabeth Rodriguez), and her daughter, Laura (Dafne Kane), Gabriela implores the one known as The Wolverine to help them get safely to an Eden that exists in South Dakota for there are bad people after them and being one of the few mutants left alive in the world, it would seem Logan is their only hope. These bad people, a mysterious figure named Pierce (Boyd Holbrook) and his scientist superior, Dr. Rice (Richard E. Grant), have had a hand in creating the mysterious Laura as they desperately want her back under their control, but as their intentions are clearly rather corrupt if not completely despicable and given she may or may not share a certain connection to our titular hero there is good reason why Logan might give in to his natural tendencies one last time. It's easy to say LOGAN is a dark and gritty Wolverine movie, but at the very least it strives to be more than that-it strives to be about something more, about the immortality this man has experienced and has grown more than weary of. About how these powers, these abilities that once made these individuals Gods among men are now eating away at them from the inside. About how our own immortality should be appreciated for the daunting devastation we would inevitably face without it. More than this, it strives to exemplify what has made Wolverine such a compelling anti-hero while making the case it's his turn to be saved rather than the other way around. Even if, by the final frame, LOGAN doesn't reach the emotional level it yearns to achieve it still makes its case and does so in an impressive manner. As the aforementioned centerpiece, Jackman is really going for broke here-he makes the viewer understand how much the character's priorities and aura have changed; that his once solemn edge is now pure rage. This rage is easily dispersed anytime someone dares to challenge or cross him in any way. It's doled out due to his low tolerance for, well...pretty much everything, but it's also let loose due to a certain amount of fear. Jackman carries this kind of angst we've never truly seen in the character before-where his inherent sense is to save, but his logic and self-awareness tell him otherwise. It is a trait that serves to explain the inner-conflict and pure strain that we see conveyed on Jackman's face. This is what has become of The Wolverine. One gets a sense he can hardly believe it's come to this as well. That for all the efforts to find himself and help others that he has still somehow wound up this lost. It is this performance and embodied mentality that provides the majority of the emotional throughline in LOGAN, but this is not only Jackman's last stand as Wolverine, but Stewart's final turn as the now legendary Professor X. For as long as Jackman has portrayed Wolverine, Stewart has done the same for a total of seven films (just shy of Jackman's nine) providing the foundation for what the X-Men would become. Here, Stewart is terrific even in the tragic arc that sees Professor X go from frail and thoroughly defeated while battling a dementia-like state to grasping that last surge of life we receive and milking it for all it's worth. Between Stewart's newly-embraced indifference to how he is perceived and Laura's general lack of experience in the real world there is just the right amount of humor in LOGAN as well. 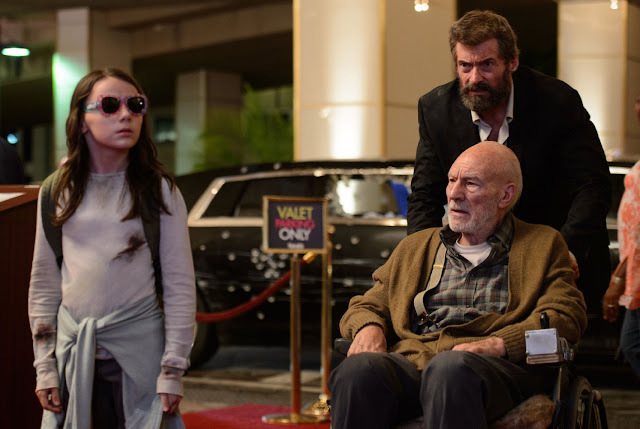 Laura (Dafne Kane), Logan, and Charles Xavier (Patrick Stewart) are forced to go on the run in LOGAN. What is handled exceptionally well is the introduction of X-23 AKA Laura who might have easily become the star of the film if Fox had persuaded Mangold he needed to make this more of a "passing of the torch" film rather than the pure, unadulterated Wolverine movie that it is. Don't get me wrong, the character of Laura is still very much a key part of the narrative and Kane, the young actress portraying her, is phenomenal in a role that is almost a non-speaking part, but this is one hundred percent Logan's movie. The appearance of X-23 should not go without being discussed though as Kane is able to convey the abandonment and confusion the character is thrust into through her facial expressions even when her small face is largely covered by sunglasses. She is able to hold her own in combat scenes that would make grown men quiver and, despite her stature, measures up fully to those who oppose her-dispensing of the particularly vile Pierce and his goons without hesitation. It is arguably one of the most subtle star-making performances ever given and would be a shame if we never get to see Kane inhabit this role again. Furthermore, Mangold never allows the presence of a child going on murderous rampages to be taken as anything other than what they are-lending them an all the more chilling quality. He doesn't amp up the soundtrack (though Marco Beltrami's score is effective especially in its ode to the Western genre) and he doesn't hyper-stylize the technique, but rather, like that of Wolverine-the fight scenes are scrappy with both Wolverine and X-23 taking literal stabs wherever there is an opening with little order to the chaos. The big difference with LOGAN being that they received approval for an R-rating and thus allowed to show to the full extent the damage those adamantium weapons can do. 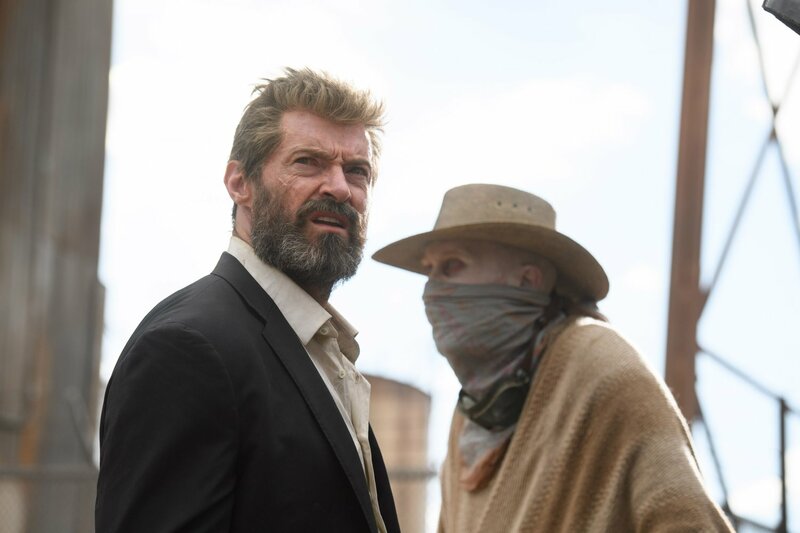 Mangold, who previously directed Jackman in The Wolverine and funnily enough Kate & Leopold which also co-starred Liev Schreiber (funnily enough), seems to have approached LOGAN as a western with its protagonist gunslinger replaced by our titular mutant. There are heavy references made to Shane, the 1953 western starring Alan Ladd and Jean Arthur, but Mangold even goes so far as to mirror the principles of the narrative-chronicling a man who has resigned to settling down, attempting to make a life with some sort of structure in his waning years before an unavoidable conflict draws him back into action. Mangold, who also served as a co-screenwriter and gets sole story credit, sets the film in a not too distant future where the aesthetic would fall in line with the gritty futurism of something like Alien. This isn't the glossy future where neon bulbs have replaced all that is fluorescent, but rather where the cars appear futuristic to our modern eye yet worn due to the wear and tear they've undergone. Touches such as this give LOGAN the feel that not only is our hero slowly dying, but that the world-in its present state-is also passing away. With open, red desert landscapes and a second act that takes us on a road trip from the South to the Midwest United States where Logan, Laura, and Professor X are allowed glimpses of a normal, average existence there is a real sense of breaking things down to their simplest form so that these characters are able to understand the true, genuine worth of the impact they've made on this planet. Which, ultimately, is what Logan deserves-especially since all inevitably goes wrong one last time.